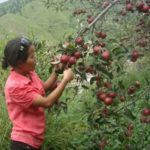 The Crawford Fund is delighted to announce that Mrs Sita Bantha Magar, an Agro Enterprise Development Specialist from Nepal, has been awarded the 2013 Crawford Fund Fellowship. With an indigenous farming background, Mrs Magar is an agriculturalist with strong, diverse and hands-on knowledge, backed by theoretical understandings of underlying scientific principles. Her academic and professional experience includes work in private enterprise, NGOs, the UN FAO and her current position as Technical Officer for the UN’s development agency UNDP in Nepal. In her role with the UNDP, Mrs Magar has been involved in improving agricultural practices and skills among poor women and excluded groups within the citrus industry – as well as strengthening infrastructure and capacity of select sectors. The aim of the UNDP project is to create a model for supply chain management with a focus on quality maintenance of fruit from the farm gate to the consumer’s table. Thanks to the Fellowship, Mrs Magar will be able to spend time at the Central Queensland University to learn about quality control, supply chain management, farm practices and post harvest activities. She will attend field trips in order to gain an understanding of Australian production, postharvest and storage, and observe Australian horticulture and marketing systems in Queensland with a focus on mandarin orchard establishment, irrigation and nutrient management, logistics supports and postharvest management by small scale producers in the Rockhampton area. Other field trips will include visits to large-scale producers in Abbotsleigh Farm and Childers, as well as a visit to Brisbane markets and major retailers. She will arrive in Australia in March, spending a month observing the industry and interacting with farmers before returning to Nepal in April. The Crawford Fund Fellowship was established in 2002 with the generous support of Dr Brian Booth AM FTSE. The aim of the Fellowship is to provide further training of a scientist in agriculture, fisheries or forestry from a selected group of developing countries, whose work has shown significant potential.